Nada (Roddy Piper) arrives in Los Angeles with nothing but a backpack and a belief that the American system will be on his side as long as he is driven and works hard enough. He is able to snag a job at a construction site and meets Frank (Keith David), a hardworking man with a wife and two kids that he has not seen in six months. Although they are not exactly buddies, Frank nevertheless invites Nada to a homeless encampment in front of an Episcopal church for some food, shelter, and companionship. Suspecting that there is something very strange going on inside the church, Nada snoops around. Eventually, he ends up in a room full of boxes that contain hundreds of sunglasses which have the special ability to reveal subliminal messages in pop culture. 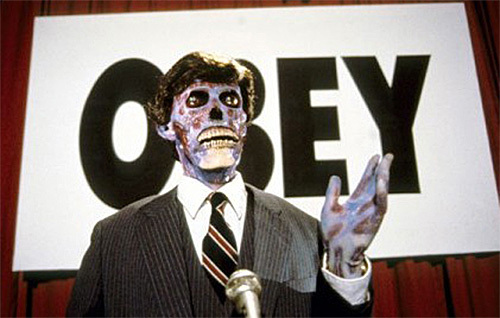 Based on a short story by Ray Nelson, “They Live” has a fantastic premise but the screenplay and direction by John Carpenter take what could have been a pointed satire about consumerism and make it more about fighting with fists and shooting guns. Its best moments stem from Nada rediscovering the world as it truly is when he puts on the seemingly ordinary sunglasses. We see the world through his eyes and we discover with him that the colorful and detailed posters, magazines, newspapers, and books actually feature commands in black and bold Helvetica: “Sleep,” “Obey,” and “Marry and Reproduce.” Certain people walking around the city turn out not to be humans at all. Some, mostly the rich and those in power, have skeletal or reptilian visages, all part of a mysterious alien force that has big plans for humans. Instead of propagating the tension from the discovery, the picture eventually focuses on Nada attempting to convince Frank to put on the sunglasses. Frank does not want to because he reckons himself a man who minds his own business, and so there is an approximate ten-minute hand-to-hand combat that takes place in a back alley, mildly amusing within the first minute or so but quickly wears out its welcome. While I had no problem believing that the two can defend themselves, I had trouble buying into the fact that they are still able to get up and walk away after beating each other to a pulp for such an extended amount of time. It comes across as silly but in an off-putting way. It felt like I had just watched a schtick by The Three Stooges for an hour. Instead of watching the kind of violence that holds no value, I wanted to learn more details concerning a world that is no longer under humans’ control. Who is the main being in charge of the mind control? How will the aliens benefit from living with humans who are unable to think for themselves? While such questions are hinted at, no actual answer is given even though the audience, after investing the time to figure out what is going on, deserve to know. The action sequence in the alien base is poorly executed and unbelievable. It is difficult to buy into the idea that two men with no military training can potentially singlehandedly overpower a well-established regime. Instead of taking the time to explore its great ideas, its attention and efforts shift to the look of, for example, the tip of the gun every time a bullet flies from it. It becomes depressing and uninspired—a generic action picture. “They Live” offers some amusing one-liners but I could not help but feel gravely disappointed due to its proclivity to consistently underachieve. When the mood turns serious and dealing with the material’s gravity feels exactly right, the immediate answer is just another joke. Its lack of variation when it comes to dealing with the sharp satire of its template inspires somnolence. A bit dated, but still fun if you take into consideration when it was made. And also the fact that it has Roddy Piper in the lead. Good review Franz.